A non-venomous snake that is on average 6-8 feet in length, the coloration of this species is striking. 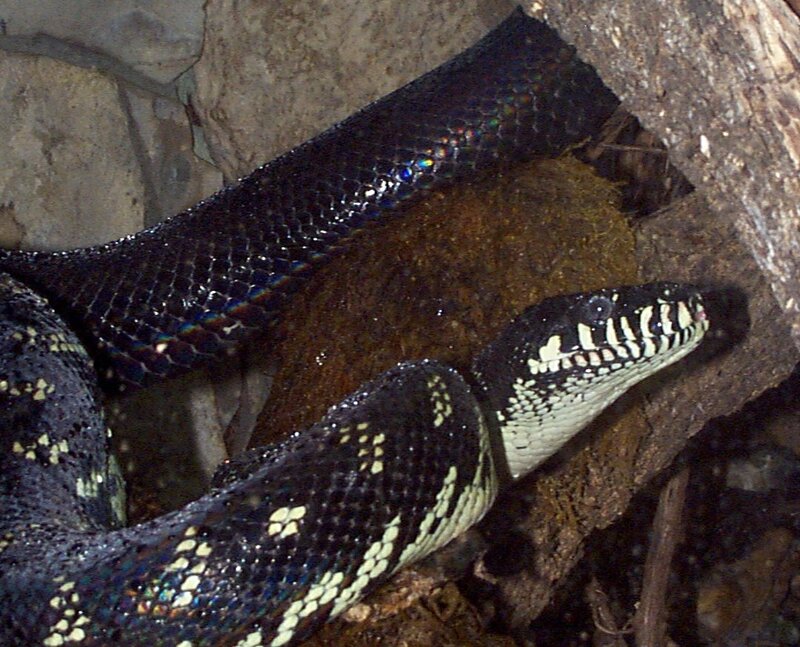 The upper part of the snake is a shiny black with a purple-blue iridescence. It has white, diagonal markings on the lower part of its body which cover the first third of the snake, white "bars" on its lips. Endemic to New Guinea (it's found only there). It seems to favor humidity and low light - almost nothing is known of its activities in the wild. Pythons are constrictors. They grab their prey with their teeth, and then quickly wrap coils of their bodies around the prey and squeeze. They don’t actually crush the prey and break its bones, though. Instead, they squeeze tightly so that the prey animal can’t breathe and it suffocates. The snake then begins the leisurely process of unhinging its jaw and swallowing the prey whole, usually head first. 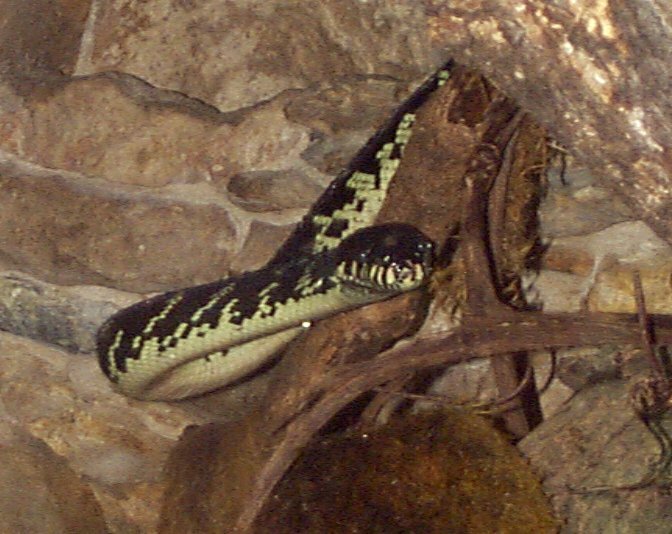 This is accomplished with rhythmic muscular contractions that pull the prey down the snake’s throat and into its stomach. How the snake does breathe while its mouth is full? It has a special tube in the bottom of its mouth that stays open to one side to take in air. Like most snakes, pythons don’t chase after their prey. They are ambush hunters, remaining still and hidden until a possible meal comes close. Then the python strikes quickly to catch the prey. They use both sight and smell to locate prey. Pythons also have an additional advantage: most have special temperature-sensitive "pits, or holes, along their jaws that can sense the heat of a nearby animal. This helps them find prey even in the dark or among dense foliage. 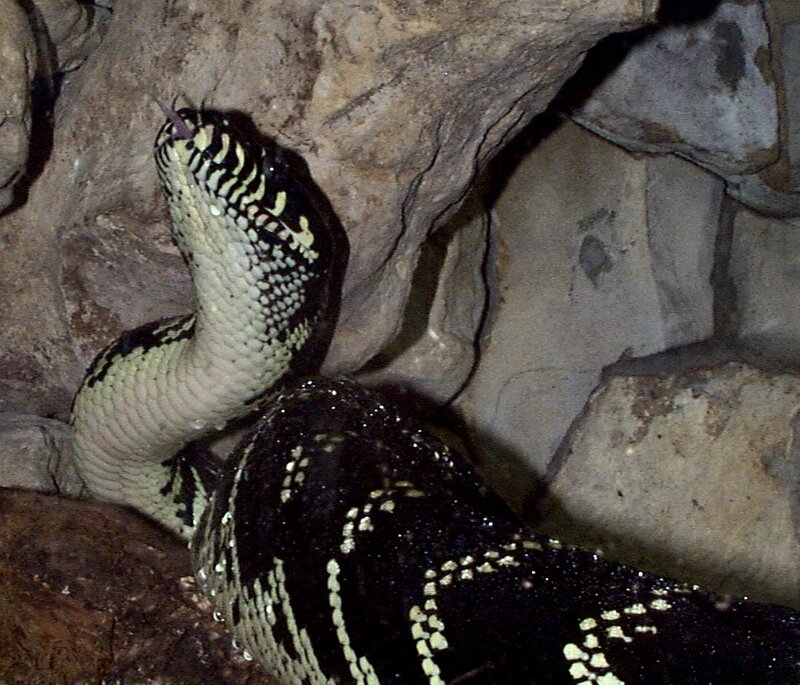 Unlike their close relatives the boas, pythons lay eggs. Some species lay them in a shallow nest or even cover them with leaves and soil. But what’s really remarkable is that most python mothers stay coiled around their eggs to protect them while they develop, and if the temperature gets too cold, the mothers of larger species warm their eggs up by "shivering.” This involves rhythmic contractions of the muscles and is described as looking like the snake has the hiccups. Even though snakes are ectodermic, the mother python can, amazingly, raise the temperature of her eggs up a few degrees by doing this. It takes a lot of energy, though, so she may not reproduce again for two to three years as she gains back the weight she lost. After the eggs hatch, she leaves and the babies are on their own. 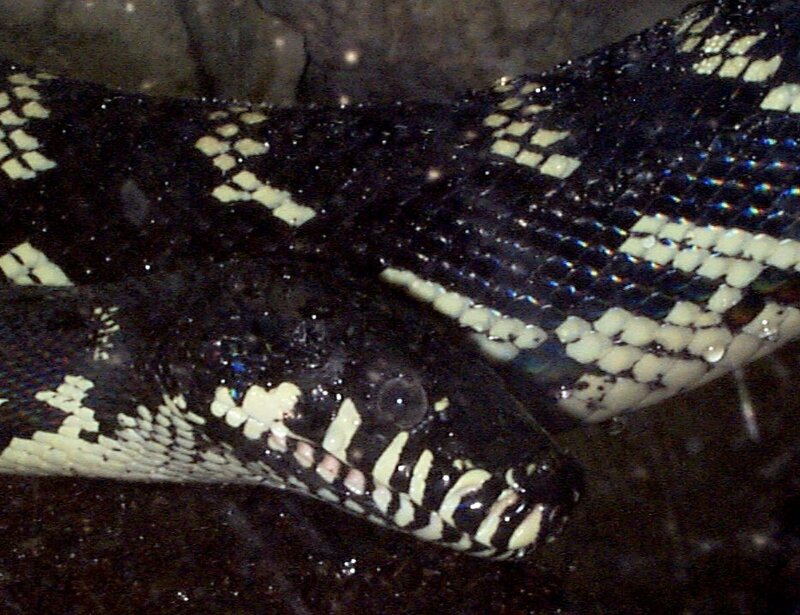 Boelen’s Python features velvety scales with an interesting iridescent glow.